There would indeed be the never ending flows of pouring tears, heavy heartache, the feeling of guilt of not able to save a life and occasional mood swings. That was exactly how I felt when my favorite cat, Jeremy, passed away two weeks ago. I knew I had to stay strong but yet I was so deeply affected by my worst enemy – emotion. It was until a close friend told me her story about the rules of life when someone had decided to have a close relationship with another, may it be a person or a pet. Before I went to sleep, I decided that the next morning I would go and get a pet. I was not sure if it would be a dog or cat or bird or something else. All I knew was that I needed, no, wanted to share my life with another creature that would accept my friendship and affection. As I slept, I fell into a deep dream. There before me sat the most beautiful creature, neither male nor female. To either side of this wondrous creature, there were two identical waterfalls with deep clear pools at their base. From each waterfall, the most crystal blue water cascaded down. I was entranced. Never before had I seen such beauty, such serenity. Wordlessly, the creature motioned me to come towards the pools at the base of the waterfalls. I noticed that at each pool, there was a small silver cup attached to a fine silver chain. "Dip thy finger into the pool and taste," the creature said as it gestured to the pool to its left. I did as instructed. As the clear cool liquid touched my tongue, my stomach clenched with pain and my heart pounded fiercely within my chest. Hollowness rang throughout my being that I feared I would never recover from. "This is the Pool of Loss." the creature said and then it motioned to the other pool of water. "Dip thy finger into the pool and taste." Warily, I drew my forefinger through the water of the other pool of water. As my finger touched my tongue, a joy so deep and pure touched my soul. A wave of happiness and wonder drowned the pangs of sorrow and loss the first pool had caused. "This is the Pool of Memory," the creature said. 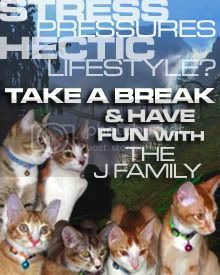 "If you take one of God's creatures into your heart, you must be prepared to drink from both pools. Do you accept this as your covenant, your bond with one of God's creatures?" "Then drink from each pool." The creature instructed as it motioned towards the silver cups at the sides of the pools. "For now they will bear no taste, but in time you will discover how much you have partaken of each." The very next day, I went and found a kitten at a local pound. It was the smallest one of the litter and it was the one who seemed to need me the most. I watched it grow and play and I reveled in the smallest joy it brought to me. But then without warning, it was taken from me in a way most sudden and cruel. Once again I felt the pangs I had felt in my dream when I tasted the waters of the Pool of Loss. Only this time, I thought the pain would never leave. Then, I remembered the taste of the waters from the Pool of Memory. Slowly the pain of Loss began to subside, and was replaced with the joy of Memory. Now I realized that I had drank more from the Pool of Loss than the Pool of Memory in my dream. But now I knew that the Pool of Memory brought more than enough comfort to offset the pain the Pool of Loss could cause. Therefore, the drinking from the Pool of Loss had to stop someday and somehow. It should be now as the water from the Pool of Memory would help ease the pain and sadness I had within me. For each and every of those memories, I should be glad that I had the opportunity to spend the happiest moments of our lives together, bringing smiles to each without fail daily. I still miss him but life has to go on. I’m sure he won’t want me to be sad forever. 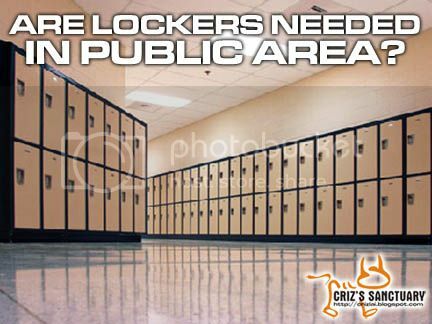 ARE LOCKERS NEEDED IN PUBLIC AREA? The answer would surely be a yes. Can you imagine going for a swim and leaving all your belongings in the open? Your valuables might just attract the eyes of some thieves, usually found lingering about at such public places. There was a time when one of my friends at a public swimming pool lost all his valuables which included his branded attire. He has to call someone to pick up a set of clothes in order to get home. The first question that hit my mind was why there were no lockers around to prevent such cases from happening? I personally had such an experience while visiting a nearby mall. Since there were no lockers around, I had to lock my helmet onto my motorcycle. By the time I had finished shopping and went back to the motorcycle park, my helmet was gone. Someone managed to cut off the strap and ran away with my costly helmet. Incidents like this should not have happened if only the mall management would allocate a space for public lockers. Another incident happened when I was visiting a client in a semiconductor factory. It was the regulation of the factory to disallow anything electronics into the factory. Thus, I had to entrust my cell phone and laptop at the security checkpoint. Eventually after my meeting, I had a hard time claiming back my cell phone as it got mixed up with a bunch of cell phones of the same color and make. Someone must have accidentally knocked onto the small cupboard with all the visitors’ electronic gadgets in it. Since it was the regulation of the factory, why the management did not even consider having some pigeon hole like lockers? If I were to be allocated a locker with proper numbering, such silly incident may not have happened. 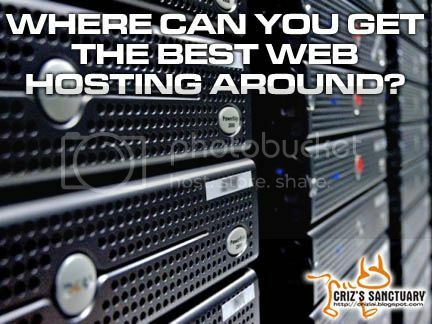 WHERE CAN YOU GET THE BEST WEB HOSTING AROUND? Nowadays, you would notice that the blogosphere has grown bigger with more and more bloggers appearing to share their piece of their mind. You might wonder how far this is true, considering that a prominent social network has almost controlled the web users from all corners of the world. One thing for sure is that these users might rant about their daily activities very often but on the other hand, they would also like to archive their experiences or products which could easily be accessed through the internet in years to come. With domain names being sold so affordable for just anyone and great web hosting companies easily available throughout the internet, owning a personal or business website has never been so easy. There are even many free tutorials and ready-made templates available online to make the best out of your website. Some even came with Search Engine Optimization (SEO) features for easy online search such as from Google, Yahoo and many more. Firstly, you would be required to identify what would your target market be, in order to get the best web hosting servers to meet your needs. Would the web hosting be just for personal website/blog or would it be for corporate or online business? As each category has its own requirements, you have to identify which web hosting company suits you best. There’s no right or wrong in choosing any of the abovementioned companies but make sure it’s one that would be dedicated to your interest in a long run.